The European University Viadrina is located in Frankfurt (Oder), Germany, on the Polish border, about 80 km from Berlin. Please, do not mix up Frankfurt (Oder) and Frankfurt am Main! You may check the interesting podcast "The other Frankfurt" on this topic. Check also our podcasts on restaurants and bars in Frankfurt (Oder). More information about Frankfurt (Oder). 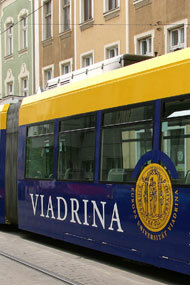 The training school takes places at the university's guest house, not directly located at the Viadrina Campus. The guest house ("IBZ") is located just a short distance from both the university and city center at Sophienstrasse 6 in Frankfurt (Oder). For the conference room, just enter the main entrance. The location is marked as "IBZ" (Internationales Begegnungzentrum) at this map. You need to get a ticket before entering the train (either at a counter or at a ticket machine). After the arrival at Berlin-Tegel you can either take a taxi (about 12 Euro) or the bus (X9) to reach the train station "Zoologischer Garten". Tickets are available at the ticket-booth or directly from the driver (2,80 Euro). From this train station you have direct connection to Frankfurt (Oder) with regional train RE 1 (see above). Crossing the border to Poland If you have a visa valid for Europe, there is no need for an extra permission to go to Poland from Germany and back. Poland belongs to the "Schengen Agreement."